Supt. Raymond Li: [Top of police command] Interesting; I never thought of that. Q: What are the differences between the HongKong Version and the Extended Japanese Version? NEW POLICE STORY II packs a violent confrontation between Jackie and an evil bunch . This stirring story about the cop named Chan Ka Kui of the Hong Kong precinct is well played by Jackie Chan. 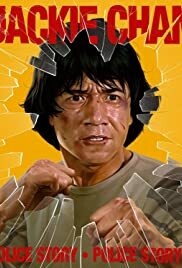 Chan Ka-Kui or Kevin Chan(aka Jackie) is a Hong-Kong cop, who scores his first big hit by virtually single-handedly apprehending and arresting a big drug- lord in ¨Police story I ¨ . In spite his success at capturing delinquents , Kevin Chan's unorthodox approach to his work as a police officer sees him removed to the traffic branch . While the crime boss recently out from prison is harassing Kevin and his sweetheart . He then plans to take a journey to Bali with his girlfriend named May (Maggie Cheung) , but while he's at a travel agency in a shopping mall, some police agents see him and report that the mall is under a bomb threat . Unable to resist the urge to get involved in officers work, Ka Kui orders the policemen to sound the fire alarm and have the mall cleared, and agrees to take responsibility for the decision . After that , the police staff (Supt. Li played by Kwok Lam) is contemplating reinstating Kevin to help them catch a group of bombers trying to extort from building owners . Then Chan looks for vengeance against the ominous villains at a cat and mouse game. This exciting movie is packed with intrigue, thrills , unstopped action , suspense , overwhelming stunt-work and lots of violence but with humor . Jackie Chan is top notch as one army man fighting a group of heinous criminals and as always he makes his own stunts like is showed on the final fake-shots . Awesome , incredible stunts and brief comic touches , as usual ; the picture is better constructed than Chan's predecessors films . The lighting-paced storyline slows down at times , but frantic action sequences make up for it . Spotlights movie include a stirring car pursuit , Jackie jumping over a bus ,impressive and interminable fights with Chan dangling and downing , a mall blow-up and a breathtaking final explosion and other extraordinary action sequences in James Bond style . This is a phenomenal action movie distinguished by nicely cinematography of the spectacular sequences , and contains agreeable sense of humor such as previous entries . In this outing Jackie teams up again to prestigious actress and fine action star in their own right , like Maggie Cheung . This is a passable action movie distinguished by ferocious sequences , and packs silly sense of humor as well as Jackie's subsequent entries . Furthermore , moving and thrilling original musical score fitting to action by J Peter Robinson . The picture achieved success in USA and around the world . However , Jackie Chan's failed at Box-office in his American debut ,¨Battle creek brawl¨ . Chan is a hard-working actor and director throughout his long and varied career .He went on playing ¨Cannoball¨ , ¨The protector¨ and "Rumble in the Bronx", until getting all American success with ¨Shangai Knights¨ , ¨The tuxedo¨ , ¨Around the world in 8days¨ and ¨Rush hour¨ trilogy , and of the course the recent ¨Karate kid¨. Of course , his big hits were ¨The Police story¨ series that won the Golden Horse Award, a Chinese version of the Oscar , the first was titled ¨Police story(1985)¨ directed by the same Chan , it was a perfect action film for enthusiastic of the genre ; the following was ¨Police story 2(1988)¨also pretty violent and with abundant humor touches. It's followed by ¨Supercop¨ or ¨Police story 3¨ and finally, ¨Police story IV : Crime story. The picture is lavishly produced by the great Asian producers Raymond Chow and Golden Harvest production and compellingly directed by Jackie Chan . Rating : Acceptable and passable , the picture has its sensational moments here and there , but also pretty violent and with abundant humor touches mostly provided by its agile star , the super Jackie . It's a perfect action film for enthusiast of the genre .